With the 2016 Olympic games now less than two months away, rising crime and instability are raising doubts among officials and residents in Rio de Janeiro. Homicides in Rio, the host city, were up in the first four months of the year compared to 2015, declining slightly in May. Street robberies, a particular concern for the athletes and spectators who will crawl the city’s streets in August, were up 24% through April, according to The Washington Post. Insecurity in Rio will be addressed by 85,000 armed police and soldiers who will patrol the city during the games, a deployment Brazilian officials say will make the games secure for visitors. Government officials and local civil-society members have blamed the spike in crime on Brazil’s withering economy, which has settled into the country’s worst recession since the 1930s, in part because of declining oil prices. “People are desperate. We have a failing economy, nothing for these communities, no opportunities,” Theresa Williamson, founder of a nonprofit group Catalytic Communities that works in favelas — poor, underdeveloped communities — told The Washington Post. Tensions in favelas and other parts of Rio have no doubt been exacerbated by public distrust of police forces, who have a track record of deadly brutality. Brazil’s efforts to bring order to Rio state’s favelas through a “pacification” plan launched in 2008 have met mixed results, and the initiative has been pulled back in recent months. While the increased police presence that came with pacification helped force out some criminal elements, more intense patrols haven’t been enough to eliminate instability. Funds for both development and policing are unlikely to be forthcoming. Rio state’s government has cut security budgets by 35%, amounting to some $500 million, and fuel and food supplies for officers have been reduced. “I have never faced a crisis like this,” José Beltrame, the Rio state security secretary for the last nine years, told The Washington Post. While violence in Rio may be the most worrying problem, it is not the only issue facing the games. Workers are hustling to finish infrastructure projects essential to the games — including metro lines linking various venues. In late April, a 150-foot section of a recently built coastal bike path collapsed, killing two people. 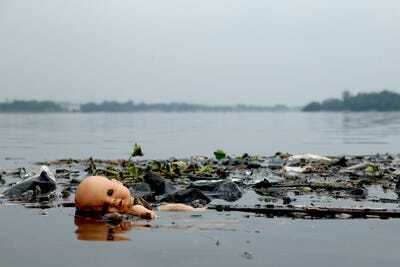 Like building projects, Rio’s waterways also pose risks for competitors and spectators. An Associated Press investigation in 2015 found swimming and boating venues contaminated with human faeces and other pollutants. All this has likely had a chilling effect on ticket sales. As of late May, only 4 million of the available 6 million (down from the 7.5 million that were to be offered) had been sold. Of the 2 million unpurchased tickets, 800,000 were for soccer events, Brazil’s most popular sport. Most Olympic cities scramble to finish preparations before the games. And Brazil also experienced delays and protests ahead of the 2014 World Cup, which it hosted successfully. But some Rio residents — many of whom don’t expect lasting gains from hosting the Olympics — are not confident there will be a repeat performance this summer. “I would tell [visitors] not to come here — that they’re running an enormous risk … not just from the risk of a stray bullet, or the violence, or lack of health care, or because of a construction project that could collapse, but because of the general situation,” a Rio lifeguard told Global Post. “I don’t think we’re prepared at all for this,” he added.